Bankers hate it. Merchants hate it. Informed consumers hate it. Bankers hate it because it is not making any money. 60% of the credit card holders do not roll over their credit. Which means they pay their balance in full. A good news for the consumers but not so for the banks. They have to provide the money for interest free for a period 20-50 days. Add to that the credit card frauds which happen. All the banks lost 36.54 crore rupees in 2008 due to credit card frauds. ICICI Bank topped the list and it followed it up by closing 1.5 million credit card accounts. ICICI Bank has even redrafted it’s retail loan strategy to reduce the exposure of unsecured loans. Merchants hate it because they have to pay a fee to the bank for using the service. What would they do? They would pass on the charge back to the customers. The charge will be in the range of 2-4% of the bill amount. Biggies like Big Bazar, Shopper’s stop won’t do it. It is the smaller shops who have the credit card machines neatly lined with some cloth on it. 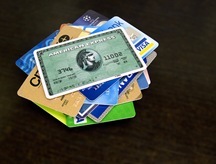 Consumers, which is us actually love using credit cards but not the exorbitant bills. Sure, cards provide a convenient way of cash less transactions. For the meticulous persons (60% of the users are that) it all make sense. They can charge everything to the card, enjoy the interest free period and then pay the balance in full. This would provide a strong financial planning and some interest accrual for the money in the bank which you otherwise have to use. But, for the people who take the cards for a ride, the cards will take them for a ride. If you miss a payment a charge of 350 is slapped on you. I rest my case with this question. Who likes credit cards? My advice to the credit card holders to use the credit card in Internet should be in unavoidable case only..Many of the websites are just tracking the cards information and they loot in our card and we come to know when the transaction SMS reaches us. Usage of Debit card is very safety when compared to credit card. I write this as my personal experience my card details was stolen from Internet and its being used for Online Jewellery purchase worth Rs.35000..So be careful and think twice before you use in Internet. Frankly speaking… being a 24 yr old shoppaholic n working in an internet company I still prefer paying by debitcards. Dunno some how the idea of getting a creditcard hasn’t attracted me enuf. Somehow I never felt that the process is simple n secure. On the other way, many of my frens have it n keep swiping n then regretting when statements come !!! It is currently just the sensible customers who love them and make full use of them. Banks need highly connected and automated processes for credit checks, servicing and fraud management to make a profit out of this business. Caveat: Welcome to CC-Hell if the banks goof up on the processes – I have used the cards of most large banks in the country and love the processes at ICICI and Citibank. HDFC and HSBC processes are the worst (border on the utterly senseless!) and can actually end up creating a lot of problems for the user. Neutral views on SBI, Stan Chart and ABN AMRO. No views yet on the others. Ironically my name was wrong on the HSBC card too. I guess you are not the only person Rabi. Cards are consistently inconsistent -just like Kolkata Knight Riders. I have personally faced CC problems in my life. One was HSBC which first got my name incorrect. The replacement card which I got with correct name, came with a surprise fraud transaction of 3500 Rs. After multiple complains they removed the amount, but not the fine (because I didnt payback the fraud amount, Can you believe?). I again logged a complain, this time my card was blocked. I was happy I stopped receiving any statements, and off course I never wanted to use any other HSBC card again. To my amazement I again got one statement this month with my incorrect name asking for 5000 odd Rs…… Grrrrrrrrrrr!!!!!!!!!! Second case was with SBI, its a smaller issue but I stopped using it either. Now I’m using one ICICI Credit card for life saving purposes only.